"It's all in the mind, y'know…" Get your psychedelic drugs ready, it's time to take a trip back into the wacky world of The Beatles' Yellow Submarine. 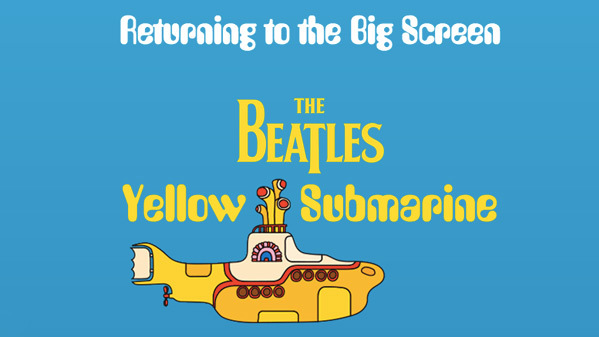 The classic, wacky animated movie Yellow Submarine, released in 1968 as The Beatles' fourth feature film, is returning to theaters/cinemas in the US and UK. Abraorama has announced the re-release for the 50th anniversary, which will feature a brand new 4K digital restoration of the film. The restoration was done carefully frame-by-frame in order to maintain the delicate nature of the original hand-drawn artwork. It also features a completely new mix in 5.1 stereo surround sound. As always, when a film like this heads back to the big screen, it's the best time to catch it and experience it the way it was meant to be seen. This is one of those films I still haven't watched, so I'm looking forward to this. The Beatles agree to accompany Captain Fred in his Yellow Submarine and go to Pepperland to free it from the music hating Blue Meanies. Yellow Submarine was directed by George Dunning, the only feature film he made. The screenplay was written by Lee Minoff and Al Brodax & Jack Mendelsohn and Erich Segal; based on the song first heard on the "Revolver" album. "Yellow Submarine was restored in 4K digital resolution by Paul Rutan Jr. and his team of specialists at Triage Motion Picture Services and Eque Inc. The film's songs and score were remixed in 5.1 stereo surround sound at UMG's Abbey Road Studios by music mix engineer Peter Cobbin. Due to the delicate nature of the hand-drawn original artwork, no automated software was used in the digital clean-up of the film's restored photochemical elements. This was all done by hand, frame by frame." For more info & to get tickets, visit the official website. Back in theaters this July.